Beijing's xinhuanet.com reported on December 30 that 11,000 kilometers (7,000 miles) of new freeways (motorways) were built in 2012. This is equivalent to more than 150 percent of the freeway mileage in California. Based on figures reported at the end of 2011, the additional 11,000 kilometers would increase China’s national freeway system (the National Trunk Highway System) to approximately 96,000 kilometers (60,000 miles). This is approximately 20,000 kilometers (12,000 miles) longer than the US interstate highway system, as reported in 2010. 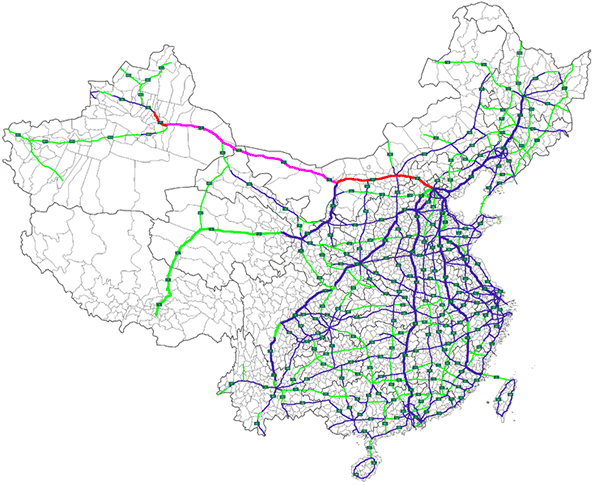 As a result, China's national freeway system is the longest in the world. Both China and the United States have additional freeway segments that are not a part of the national systems. In 2010, the United States had approximately 99,000 kilometers (62,000 miles) of freeways, including the interstate system. Data is not readily available for a number of urban and provincial level freeways in China that are not a part of the National Trunk Highway System. It seems likely that the US continues to lead, though by only a small margin, in total freeway mileage. However, China is continuing to expand its system at a rapid rate. This is evident in the map below, which uses purple and green to indicate uncompleted freeways, while blue and red indicate open segments. Long stretches remain to be completed to Urumqi, the capital of Xinjiang, and beyond to the border of Kazakhstan in the Pamir Mountains, as well as two long routes to Lhasa, the capital of Tibet. A number of additional routes are also planned in the densely populated eastern third of the nation.